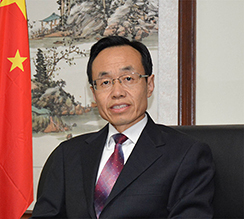 On December 19, Chinese Ambassador to Ghana, H.E. 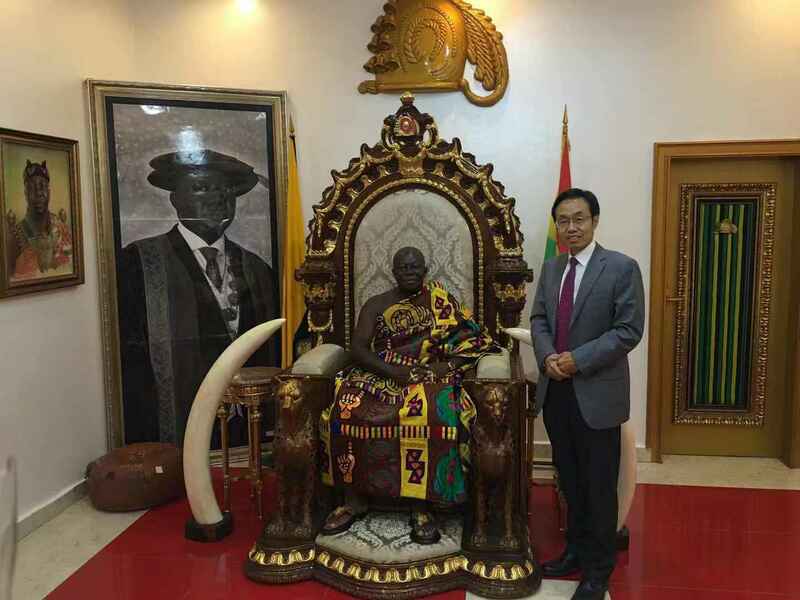 Shi Ting Wang paid a courtesy on Ghana's most influential traditional leader His Majesty (HM) Otumfour Nana Osei Tutu II at the Palace of Manhyia. The two sides exchanged views on China-Ghana relations and cooperation. Ambassador Wang thanked the Asantehene for coming all the way to meet with him. He said that China-Ghana relations share a long history of friendship and has played a leading role in the history of China-Africa relations. H.E. President Nana Addo Dankwa Akufo-Addo paid a state visit to China and attended the Beijing Summit of the Forum on China-Africa Cooperation (FOCAC) in September. China-Ghana relations have entered a period of high-level development. H.E. Ambassador Wang affirmed the role of traditional leaders in the economic and social development of Ghana. China is willing to work with Ghana to actively implement the outcomes of President Akufo-Addo’s state visit to China. Ambassador Wang stressed that yesterday China solemnly celebrated the 40th anniversary of the reform and opening up. H.E. President Xi Jinping delivered an important speech recalling the remarkable achievements China has made in the 40 years of reform and opening up and emphasized that China will continue to push forward the reforms and opening up in the new era. China respects Ghana's independent choice of its development path suitable for itself . China is willing to work with Ghana to strengthen exchanges of experience in governing the country and enrich the content of pragmatic cooperation between the two countries to benefit the peoples of the two countries. The Asantehene warmly welcomed Ambassador Wang and congratulated China on the 40th anniversary of China's reform and opening up. The Asantehene said that Ghana-China relations enjoy long-term friendship and China has made important contributions to the economic and social development of Ghana. The New Patriotic Party (NPP) Government has vigorously promoted infrastructure construction, in which China has played an important leading role. The Asantehene hoped that the political exchanges between the two countries will continue to maintain at high level, while at the same time promoting economic and cultural exchanges to achieve more fruitful results. He also stressed that the reform and opening up policy has brought earth-shaking changes in China, which is of vital significance to the development of Ghana. The Asantehene looks forward eagerly to an early visit to China to learn from China's valuable experience in reform, opening up, and poverty alleviation in order to benefit the people of Ghana as soon as possible.